Today I hung up my John Deere cap and turned the key on the lawn mower to "off" hopefully until next spring. Wow. That felt mighty good. I'm feeling pretty guilty however. My truck bed was completely loaded with leaves and grass clippings from the lawns I mowed in town and I tossed three full bags on the top to hold them down. Got home, parked the truck out back where I "dump" and came in the house for some grub. When I returned, I realized there were only two bags in the truck. Sure hope no unsuspecting folks in a tin can car hit a large bag full of yard waste! Oops!! Anyways, now I'm ready for winter. NOT! Change the subject QUICK! Shall we have a link party?! Yes, I think we shall!!! Let's see the features from last week! Little Bitty Darn Houze. Yes, I substituted a word in there! :) She took an ugly dresser (I think that thing was??) and made it a sleek new entertainment center. Well done! Oh and I'm totally salivating over that gorgeous chair!!! Ohhh I lovest it! I always LOVE Curbside Creations' creations. She's a creature of creating amazing creations! Okay, so a beautiful woman like Rita can hardly be called a "creature"... but ya know. And she's a girl after my own heart - mixing together oops paint to CREATE her beautiful pink color. Yes! 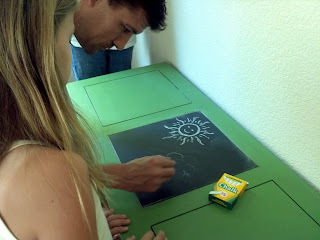 Big Family Small Apartment had two amazingly cool green table redos in one post - total opposites in style but I loved them BOTH so you need to check out this one AND the distressed green end table that is so stunning! Lovely trash to treasures! Girl you can call me whatever you'd like! :) Thanks again for the feature!! Got Two today woo hoo!! Totally Irrelevant Comment: You mow lawns, too??!! Is there anything you *don't* do, dear Kammy?